The Moultrie Flag, also known as the Liberty Flag, is a strong symbol of the Southern role in the American Revolution. It’s also a handsome flag with a simple design on a beautiful blue color. The flag was developed specifically for the Battle of Sullivan’s Island, a short but important engagement in the Southern theater of battle during the American Revolutionary War. In 1775, in the lead up to the American Revolution, Colonel William Moultrie wanted a flag that represented the new American nation. Moultrie was the commander of the 2nd South Carolina Regiment. He commissioned a design based on the uniform of his soldiers. This was the distinctive deep blue you see on the flag today. The crescent moon might come from the caps of the soldiers, which initially bore the legend “Liberty or Death.” Some historians believe that it’s instead a form of neck armor. Whatever the symbol’s original, its message was eventually simplified to “liberty,” which is either written within the crescent or in the center at the bottom of the flag. Fort Moultrie is the current name for several forts on Sullivan’s Island in South Carolina. These forts were first built to defend the city of Charleston, with the original built of palmetto logs. On June 28, 1776, the flag was raised over the palmetto-log fort now known as Fort Moultrie – which wasn’t armed or ready for the attack by British forces that came. Nine British warships attacked the fort for over 10 hours. However, because the palmetto logs were still soft, they absorbed the array of cannon fire. Legend has it that some of the cannonballs bounced off, rather than penetrating the fort. Because of the successful defense, the British armada was forced to retreat and could not take the city of Charleston. This is now celebrated in Charleston as “Carolina Day,” though the fort and Charleston were later captured by British forces. During the first battle, the flag was shot away by British forces. However, a Sergeant by the name of William Jasper recovered the flag after it was shot down. He then hoisted the flag up again on a temporary pole and held it up while taking fire, until a more permanent structure could be erected. After the battle, South Carolina’s governor, John Rutledge, gave his sword to Sgt. Jasper in recognition of his exemplary bravery under fire. Sgt. Jasper later died of wounds he received while trying to recapture Savannah, Georgia, from the British. Several states have counties and townships named after Jasper. After this battle, the flag became the battle standard of the South Carolina militia. The liberation of Charleston represented the end of the American Revolution. And after the liberation, the flag became the first truly American flag to be flown over the South. As such, it has become a popular symbol of American independence throughout the Southern states – including becoming the state flag of South Carolina (which is essentially a modified version of the Moultrie flag with a palmetto tree). At the end of the Revolutionary War, the fort came under American control, but remained ready for action. In 1793, the fort was fortified stronger as part of an overhaul of American ports due to escalating Franco-British tensions. The new fort was Fort Moultrie, named after the Colonel who defended Charleston. After being completed in 1798, Fort Moultrie was destroyed by a hurricane in 1804 – leading to a brick fort being erected in its place in 1809. Not much changed until the War Between the States, other than a modernized turret. The lynchpin of Charleston’s defense became Fort Sumter, which any Civil War history buff would know, is the place where all the trouble began. After the initial fight for Fort Sumter, the Northern armies bombarded both Fort Sumter and Fort Moultrie in April of 1863. Despite being bombarded to near rubble, both Sumter and Moultrie were not surrendered by Confederate forces until February of 1865. After the war, Moultrie was equipped with modern weaponry through the 1870s. And by the 1880s, the modernization had gone so far as to turn Fort Moultrie into a series of forts. The original fort, where the flag was first conceived, was just a small part of a broader whole. While the fort continued to be modernized up until World War II, it’s now run by the National Park Service as a trip “back in time” to see what the island looked like more than a century ago. In addition to forming the basis of the South Carolina state flag, it was also the inspiration for Illinois’ Moultrie County flag. This flag is exactly the same as the original Fort Moultrie flag, using the version with “Liberty” written in the crescent. For his part, William Moultrie did what many former soldiers did once the war was over – he entered politics in the new nation. The state legislature elected Moultrie as the 35th Governor of South Carolina. While governors were not allowed to serve two consecutive terms at that time in South Carolina, Moultrie was elected to a second, non-consecutive term in 1792. He then retired to run his plantation where he wrote his memoirs, Revolution So Far As It Related To The States of North and South Carolina, and Georgia. He died in 1805. 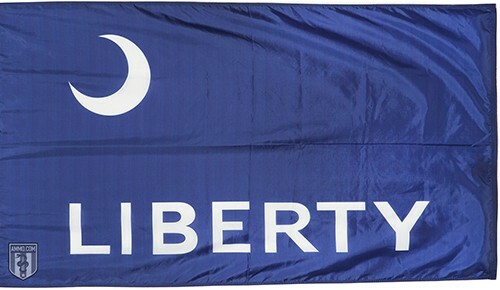 Particularly in the Southern states, the Liberty Flag remains an enduring symbol of what it says – liberty. Fly her next to Old Glory and let your neighborhood know that you stand for the same principles as the founders who fought and died for them.